Updated Feb. 23rd 2018 with illustrations of an example owned and kindly shared by Joseph Zeligs, USA. Like some other microscopy enthusiasts I have an interest in the portrayal of microscopes and microscopy related subjects on stamps. Both Fritz Schulze and myself have shared some examples from our collections on Micscape. As a related topic, I became interested in resources describing the use of vintage microscopes to study aspects of postage stamps. I'm not certain how many microscopes have been specifically designed for philately, but at least one model came to light made by Watson ca. 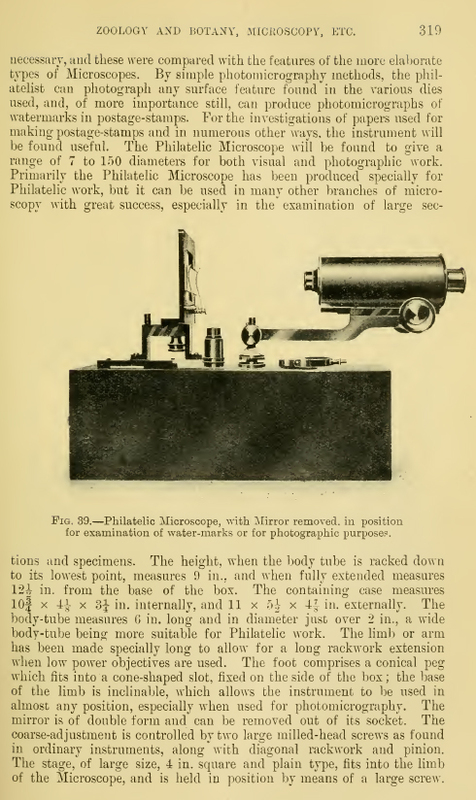 1912, their 'Philatelic Microscope'. 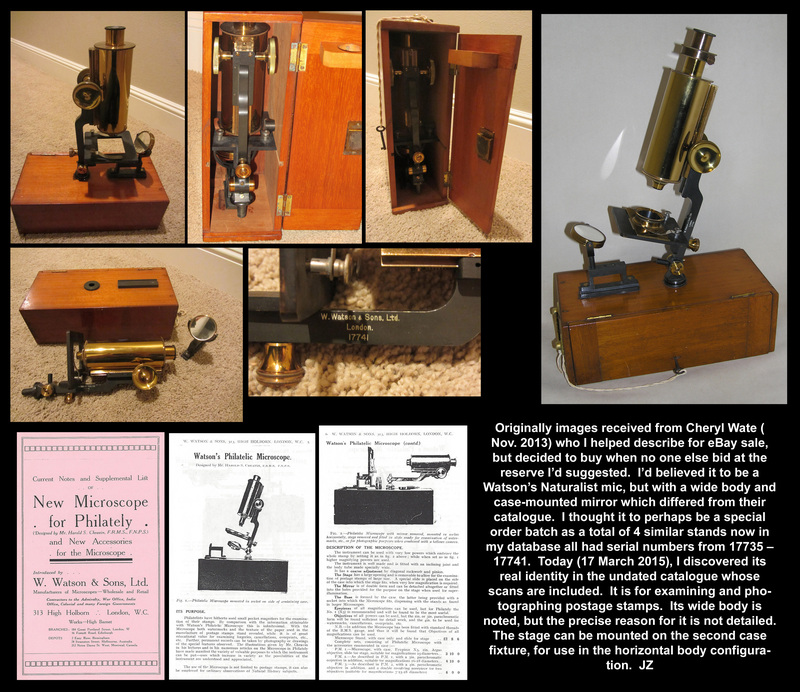 This was designed and developed in collaboration with W Harold S Cheavin and at least one resource describes it as the 'Watson-Cheavin' microscope. A feature in the Journal of the RMS 1913 describes and illustrates this model. This and other early 20th century editions are in the public domain on www.archive.org and presented below are page scans which clearly describe its design features for philately. Report of Cheavin's presentation to the Royal Microscopical Society in their Journal, 1912, p.671. Feature in the Journal of the RMS, 1913, vol. 33, issue 3, pp. 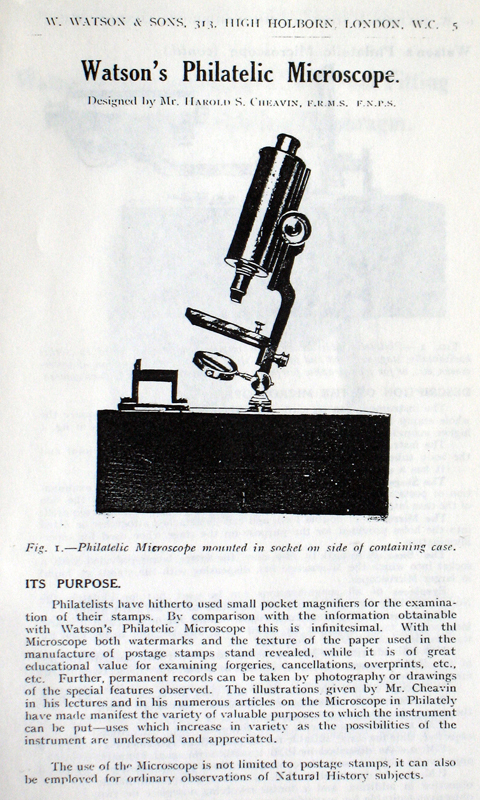 318-320 describing Watson's Philatelic Microscope. 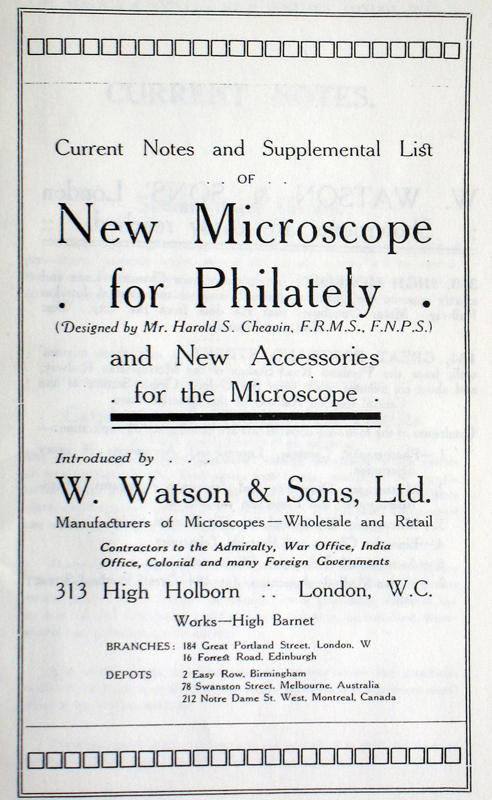 A Watson's 'Special Circular' describing the microscope is mentioned and I'm indebted to Steve Gill who kindly checked his Watson records and has scanned a Watson leaflet entitled 'New Microscope for Philately' which also describes the model and prices of typical outfits. Shown below. Above: A scan of a Watson leaflet ca. 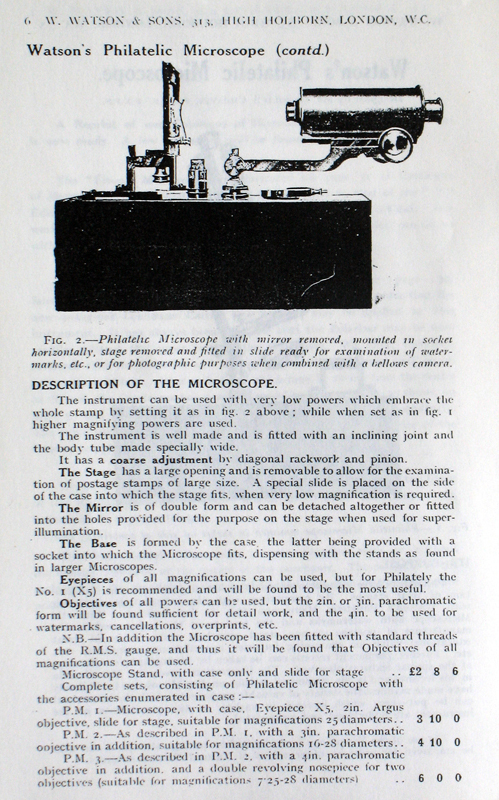 1912 describing the 'Philatelic Microscope'. Resized scans courtesy of Steve Gill. The JRMS paper mentions that Watson described the model in their 1912-13 catalogue (pages 20-21) but it is not described in their 1923 full catalogue (my copy is the CD available from Savona Books prepared by Steve Gill / Mike Samworth in their invaluable 'Little Imp' Data CD series). It's not clear how popular this model became and if many were sold; was it made to special order perhaps? W H S Cheavin wrote a number of articles ca. 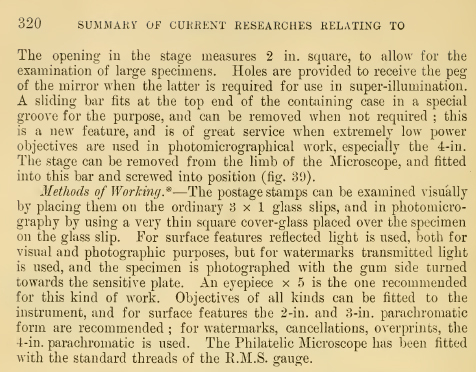 1913 in various philately publications describing its use. 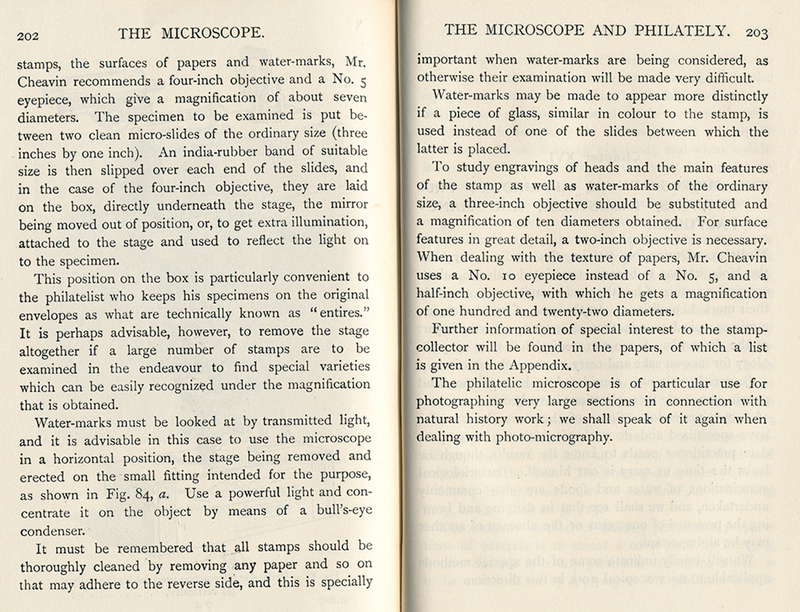 These articles were referenced in the book 'The Microscope and its Uses' by W M Webb ca. 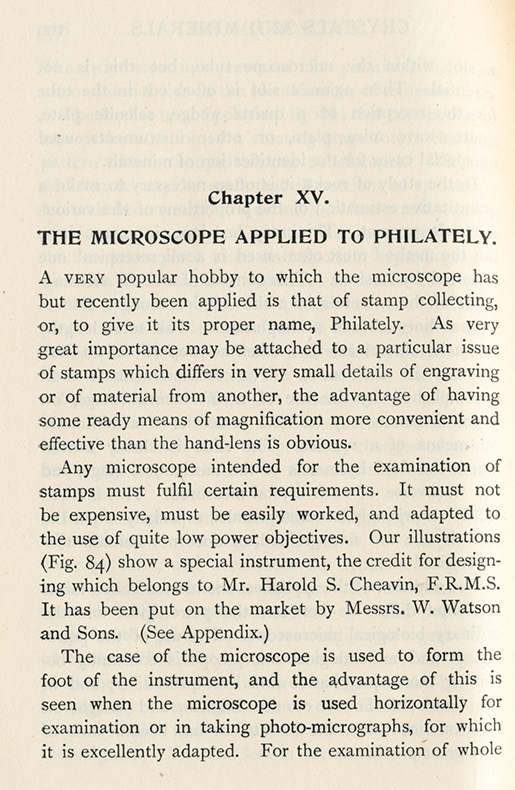 1914 which had a short chapter on 'The Microscope Applied to Philately' and which was devoted to the Watson Philatelic model. The references included those describing photography of stamps with the microscope but I have been unable to date to access these older philately journals. The chapter from this book is shown below. 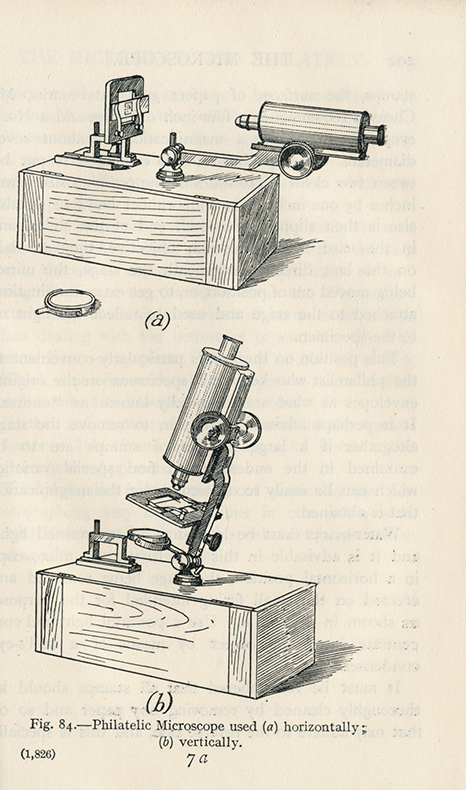 Above: 'The Microscope and its Uses' by W M Webb ca. 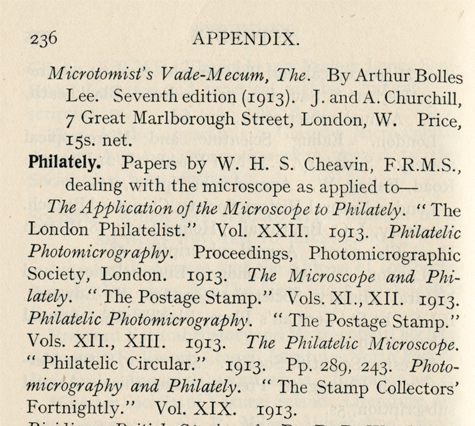 1914 which had a short chapter on 'The Microscope Applied to Philately'. The Appendix listed Cheavin's articles on the microscope's use. It's not clear from the illustrations of the microscope if it was labelled 'Philatelic' or whether the typical Watson card in the box referred to it. If not, and if examples have been separated from any instructions, examples may appear on the market where its specific use may not be realised. From my casual browsing of vintage microscopes that come up for sale online, I don't recall seeing examples. I would be interested to hear from readers who have/had one or who may have seen examples for sale (just out of curiosity—I'm not keen to own one!). Although both the paper and leaflet describe specific features useful for studying various aspects of stamps, the owner of a typical compound microscope of the time with a good tube length extension would likely be able to study stamps both with incident and transmitted light. A stereo or monocular dissecting microscope of the time could also be put to good use. The continental style limb pivot does not look that robust although most studies would have been at low to modest mags. A Google search for 'W H S Cheavin' or 'W Harold S Cheavin' reveals a variety of resources describing his studies in various branches of microscopy related to philately as well as his wider interests. Cheavin (solely?) contributed to a serial publication entitled 'Philately and the Microscope' and occasional editions are offered for sale online. He also contributed to 'Maple Leaves' the Journal of the Canadian Philatelic Society of Great Britain; their website includes an archive online of past issues. Cheavin's later philately studies included using X-rays and fluorescence. The 'Standard Handbook on Stamp Collecting' by R. McP. Cabeen 1979 (available in full on www.archive.org) on p.71 has an entry on 'X-Ray Investigation' which cites Cheavin (London), Pollack (Chicago) and Bridgman (New York), as having 'developed the technique simultaneously'. The Association of British Philatelic Societies Ltd website has a 'Who Was Who in Philately' with an entry for William Harold Squier Cheavin, which is quoted below verbatim (see Acknowledgements). "CHEAVIN, William Harold Squier DSc FCS FRES FRMS FRPS 1885-1968. 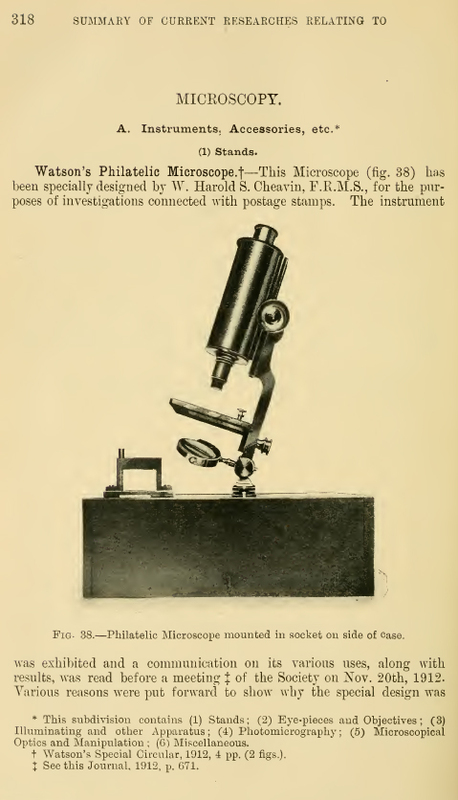 Inventor of the Cheavin-Watson philatelic microscope, 1912. Collected Great Britain and Colonies, Belgium, France, Holland, Sweden, and USA. Gained international awards. Author of 'Philately and the Microscope', 'Philately and Fluorescent', 'Philately and X-rays', 'India - Issues of the East India Company'." His affiliation with the Entomological Society suggests it was the same W H S Cheavin who wrote a number of articles in the first edition of 'The Microscope' journal in 1937, where he wrote on leaf structure, the common house-fly and the froghopper. Thank you to Steve Gill for searching his Watson archives and for scanning the Philatelic Microscope leaflet and for giving permission to share it. Thank you to John Baron of the Association of British Philatelic Societies Ltd for permission to share the 'Cheavin' entry from their 'Who Was Who in Philately' web page. Updated Feb. 23rd 2018 with an example owned and kindly shared by Joseph Zeligs, USA. Many thanks to Joseph who gave permission to share his own example illustrated in his photo composite below with additional background information. Click the image for the master. Not to be reused without the permission of Joseph Zeligs. Published in the January 2013 edition of Micscape. Updated February 13th 2018.